My blogging has dropped off a lot in the last six months, and I don’t envisage any change to that in the near future. There are other things going on in my life right now that take priority over any Internet stuff. I have no intention of deleting the entire blog  — a lot of people turn up here looking for free patterns — but as I’m barely making one entry a month, it seems pointless to pretend it’s current. I might add more patterns, on the off chance that I ever get them written up, but that will be all. Thanks to everyone who has lurked or commented over the last couple of years. 🙂 I’ve met some lovely people, and found some great blogs as a result having this one. I hope to find at least a little time to check them out once in a while. Thanks again, everyone. Over and out. 1. I have, however, pruned the content quite drastically to get rid of superfluous posts. 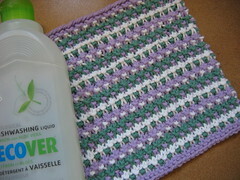 I’ve been adding more of my stash of cotton to Ravelry, and figured it must be time to knit another dishcloth. This is a modified version of a two-coloured pattern I came across in a stitch dictionary. It’s a good way to use up leftovers, and creates a texture that’s fab for scrubbing those pots and pans. Pattern is worked over 4 rows on a multiple of 2 sts + 1. Approximately 8! 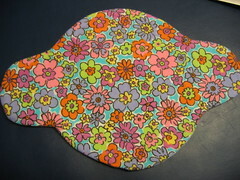 (20 cm) square. Bernat Handicrafter Cotton Solids [100% cotton; 80 yd/73 m]; Soft Violet (A), White (B), and Hunter Green (C). 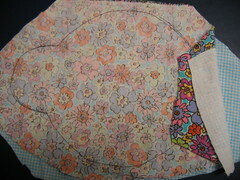 I used 20 yds (17.5 m) of A, and 16 yds (14.5 m) each of B and C.
Size 7 (4.5 mm), or size needed to obtain a fabric you like. It’s a dishcloth, so gauge is not too important. I got 19.5 stitches per 4” (10 cm) in pattern, and before blocking. 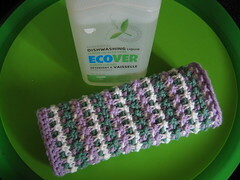 Of course, I’d only ever block a dishcloth if it were a gift for someone. Use the 3 colours in sequence, working 2 rows in each one. CO 39 stitches with yarn A using the continental long-tail cast-on, and knit one row. Row 1: K1, *s1p, k1; repeat from * to end. Row 2: K1, *yf, s1p, yb, k1; repeat from * to end. Rows 3 and 4: K.
Repeat rows 1-4 until desired size is achieved, ending with a row 4. 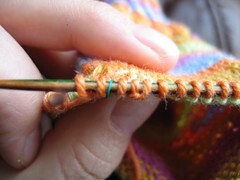 Cast off and weave in ends. are made from its distribution. Cloth pads are a million times nicer than disposables, which may contain such delightful treats as wood pulp, latex binder, super-absorbent powder, polyethylene, hot-melt adhesive…. Lovely, huh? In terms of comfort there’s simply no comparison; they’re more eco-friendly for anyone concerned about the environment and landfills; and, my personal favourite, they’re cheaper! LOL. I feel quite smug every time I walk past the “feminine products” aisle in the supermarket. 😀 Have a happy period? Why, thank you. Yes, I do now! 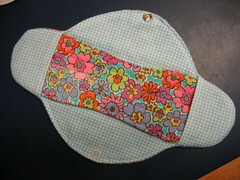 By request (from Ravelry and BusyMitts), I’m posting the templates and a [very] mini tutorial for my version of a reusable menstrual pad. (I’m not a seamstress by any stretch of the imagination, so there may well be an easier way to achieve the same result.) This one consists of two parts: a pocketed liner that snaps around your keks, and an insert pad that slips into the pockets on the liner. You can make the insert as thick or thin as you like, and you can use a couple of inserts together depending on your needs. Obviously, you may use whatever fabrics you like. 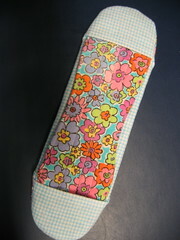 For this one I’ve used flannel for the outsides, and cotton batting for the core. I’ve had success with cores made from terry and flannel, but batting is my preferred material because it’s absorbent without being bulky. Some people will want to use PUL or nylon to provide a measure of water-proofing, but I haven’t. 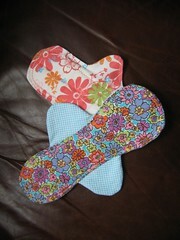 I don’t need it myself, and I prefer not to use synthetic fibres in my pads. YMMV. My instructions are for turned and topstitched pads. I actually prefer the type with a serged/overlocked edge—it’s quicker and easier to make, and results in a smoother pad overall—but the overlock stitch on my machine isn’t tight enough to prevent fraying, so for durability T & T it is. The finished size of the liner is 10.25″ long and 3″wide when snapped shut (7″ wide from wing to wing); the insert is 9.75″ long and 2.5″ wide in the middle. If you prefer a larger or smaller pad simply print out at the size you need. I.e., for an 11″ pad increase to around 113%; for an 8″ decrease to around 82%; and so on. Bear in mind that this will also alter the width, so you’ll need to take that into account. Okay…. First, wash and dry your fabrics! Print and cut out the templates. 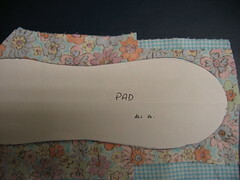 The liner and pad (insert) templates are actual size, and have no seam allowances. The one for the pocket is larger than the finished size. It’s supposed to be. Unless you want a particularly jazzy pad cut the two pockets from the same fabric. Then hem down the top edge. Using a wash-out fabric pen draw around the other templates onto your fabrics. 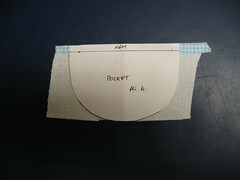 You’ll need two liner shapes, and two insert (pad) shapes in your outer fabric(s). To reduce bulk at the edges of my pad I cut the cotton batting core about 0.25″ smaller all around than the insert template, and sew it separately onto the wrong side (WS) of one of the pieces of flannel before making up. Quilting the core to the flannel keeps the pad nice and thin. Pin the right sides (RS) of flannel together, sew around the shape you drew for the insert, leaving a couple of inches unstitched to enable you to turn it the right way out. 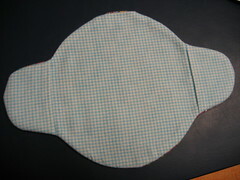 Cut away the excess fabric, turn it RS out, and stitch around the pad close to the edge. Layer the fabric for the liner as in the pic below: flannel RS facing up, then the pocket RS up with hemmed edge towards the centre, then flannel RS down. Pin and sew, again leaving a gap on one of the wings through which to turn RS out. Trim the excess fabric, turn it RS out, and stitch around the wings close to the edge. Add a popper (snap), and Bob’s your uncle! In the interests of full disclosure I have to say that when the pad is finished and folded, the shape is much too rectangular for my liking; i.e., not shaped like the gussets on my knickers. That makes the pad ruck up a bit, which is most definitely not good. I solved this problem by making the wings narrower. I don’t have a pic of how that looks, but it ends up shaped very much like the blue one in this picture. That’s the perfect shape for me. 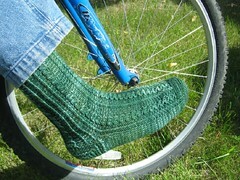 I have a new sock pattern that I’ve put up for sale in Ravelry. And I’ve already sold a few! I’ve been asked by a few people about my Rainbow Sock: how I’m using the yarn-over method without messing up the stitch count, and to share what I’m doing to get hole-free short rows. Describing the process solely in words is far more difficult than I expected, so I’ve added a few pics to help clarify. Clicking on the photos will open larger versions of them in Flickr. I expect there are better-written and more comprehensive instructions of this technique out on the web; this is simply how I used it for this project. I started out by following the instructions on the pattern, but they made absolutely no sense to me, and I ended up with a right mess, so I chose a method using yarnovers. I have no idea who to give credit to for this technique; I’ve seen it used in patterns all over the place. 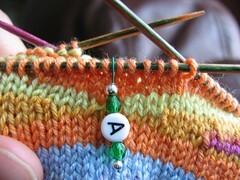 Marker used for clarity to denote start of short-row section and placement of stitches. 2. 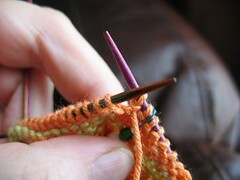 Turn work, take yarn back between the needles and forward over the top of the right-hand needle (reverse YO), purl 4. The first stitch will feel a little weird; at least, it did to me. 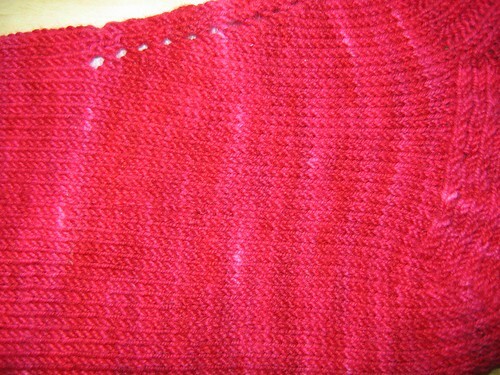 This is a top view showing the YO and the 4 purled stitches. 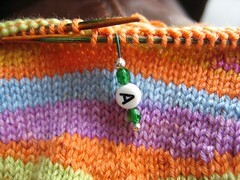 Note that after the yarnover there is an equal number of stitches on each side of the marker. 3. 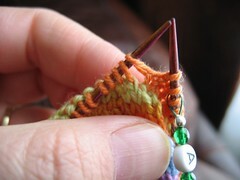 Turn work, bring the yarn forward between the needles and back over the top of the right-hand needle (YO), knit 4. 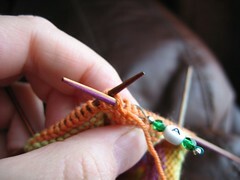 The following stitch is the YO from the previous row, and is mounted the wrong way on the needle. 5. 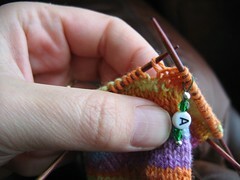 Knit the YO together with the next stitch (like a k2tog) to close the gap, and knit the next 3* stitches. 6. Turn work, make a reverse YO (as in step 2), purl 8. The following stitch is the YO from the previous row. Row 1. (RS) K2, turn. Row 2. (WS) Rev yo (step 2), p4, turn. Row 3. Yo, k 4, close the gap (steps 4 & 5), k3, turn. Row 4. Rev yo, p8, close the gap (step 7), p3, turn. Row 5. Yo, k12, close the gap, k3, turn. Row 6. Rev yo, p16, close the gap, p3, turn. Row 7. Yo, k20, close the gap, k3, turn. Row 8. Rev yo, p24, close the gap, p3, turn. Row 9. Yo, k28, close the gap, k3, turn. 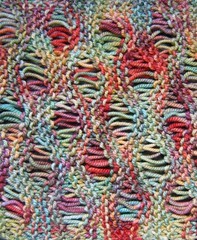 *The pattern instructs you to knit or purl 4 stitches after working the turn stitch. I found that following the yarnover method of working short-rows, only 3 stitches should be knitted or purled to maintain the correct count. Clear as mud? Feel free to contact me if I haven’t explained it well enough. All that said, I’m leaning strongly towards frogging mine. 😛 The bias is quite noticeable after 4 short-row sections, and I can only foresee it worsening after the 6 repeats needed for the foot. At the very least, I’m ripping the heel back to redo, and maybe continuing down the foot in plain stocking stitch. A few people have asked what my initial thoughts are on Cat Bordhi’s latest book, New Pathways for Sock Knitters, so here they are. Please bear in mind that this is not meant to be a comprehensive book review, and is purely my personal opinion; nothing more, nothing less. The book is soft-bound, and 9.5″H x 10″W (24cm x 25.5cm) with 136 pages. There is a master template for each of eight sock architectures, together with different designs for each style. 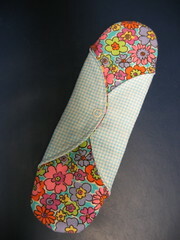 Patterns for several little “learning socks” are included. A selection of cuffs, heels, and toes is can be found at the back of the book. Information covering stitch mount, increases & decreases, how to slip a stitch correctly, wraps, and so on is located at the front. Each master pattern is written in such a way to allow the use of whatever yarn and needles you fancy. It’s a pity the book doesn’t have a spiral binding to prevent it from flopping closed. The content, however, is nicely laid out with thoughtful use of italics and font colour for clarity. The photos are clear, as are the plentiful diagrams showing stitch and marker placements for both circular and double-pointed needles. Anyway, New Pathways… isn’t like that. 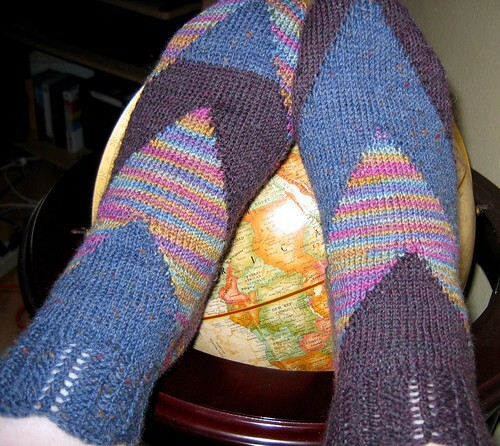 The information covering everything you’ll need to knit the socks is there, but it’s presented in a concise way. Even though experienced knitters will most likely be familiar with the techniques, I like that they weren’t omitted. Their inclusion removes any ambiguity when the instructions call for a particular procedure. The information is sound, with easy-to-understand diagrams, but the style of writing grates on me a bit. I don’t see what’s wrong with calling a stitch a stitch. It is, after all, a book on knitting! If it were to teach knitting to children, I daresay calling stitches corgis, and wraps diamond necklaces, would be appropriate, but really, youngsters aren’t the targeted readership, and the cutesy talk and imagery is just distracting. YMMV. 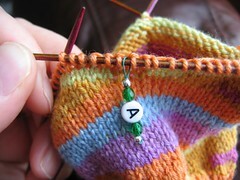 The book has a definite slant towards toe-up socks with 6 toe-up constructions, and 2 cuff-down. Now, I’m not a fan of toe-ups, but the first pattern I picked to try is just that. 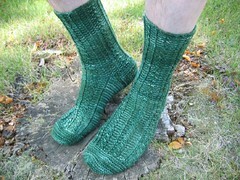 There isn’t a gusset or standard short-row heel in sight, and that’s what intrigued me in the first place. The method of shaping is not dissimilar to the one used for my Freaky Socks, although the rest of the sock is obviously quite different. Bordhi primarily uses left and right lifted increases for shaping, which she has chosen to rename leaning-left and leaning-right increases. The eight Master Socks each have their increases in different places, which is what creates the variety of styles. For people who like to follow directions, it’s all there for them. For those who prefer to experiment, it’ll be really simple to use the single underlying concept to come up with many more “master architectures” of their own. The patterns that accompany each Master, over twenty of them, are appealing and different from the usual, and the baby socks are just gorgeous! Before starting, we’re instructed to gather a list of Master Sock Numbers consisting of tension (gauge) obtained with whatever needles and yarn will be used, along with various foot measurements. A little simple arithmetic, and use of the tables provided, produces the other key numbers that are needed. 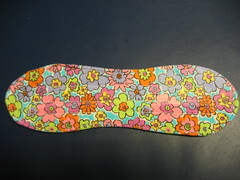 These are then slotted into the Master Pattern to create a custom sock. Despite not being a fan of the style of writing, I am a fan the book and the patterns. 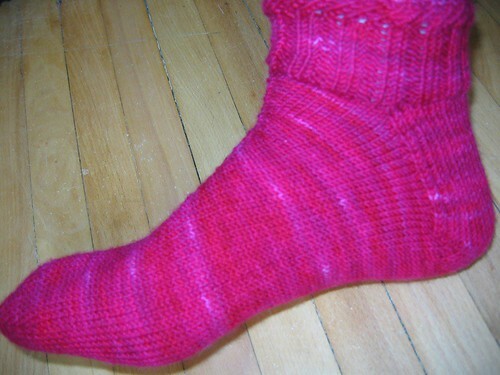 I love the fit of the sock I made, and I’m looking forward to making some of the others. 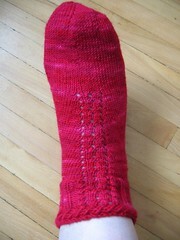 That I’ve actually enjoyed knitting a toe-up sock tells me the book was worth the price! Still looking for a way to cast off that looks pretty…. The colour has rendered really poorly in this second photo, and is better represented in the other shots. Look, Ma, no gusset line! Its mate won’t be cast on until I’ve made reasonable progress on aforementioned Tedious Task, so the pair probably won’t make an appearance until sometime in September. I’m certain there’ll be more of these in future, but I’ll take greater care to ensure I have sufficient yarn next time. 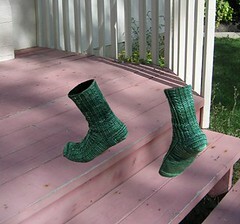 I’d have much preferred them had I not needed to make on-the-fly yarn substitutions. Either the requirements given with the pattern were somewhat short, or my calculations were wildly out when I was deciding what colours to use. Whatever the reason, I’ve ended up with a unique pair of socks! The other thing I’ll do with the next ones is reduce the number of stitches slightly. This pair has the cuff worked over 60 sts which is then increased to 64 overall. I don’t think it needed the increases. How on earth does one purl 13 stitches together at the same time? I can’t even imagine it. Then I hit upon the idea of using a DPN for the P13tog, and everything has gone swimmingly as a result. 🙂 The stitches don’t get a chance to slide all over the place with the bamboo being so much stickier. It’s starting to look like I’ve actually got something to show for all the time I’ve invested, which is nice. Then again, if I haven’t managed to fix my mistake properly, and do have to pull it all out to start again, I’ll be getting so much more knitting-time out of it, won’t I? 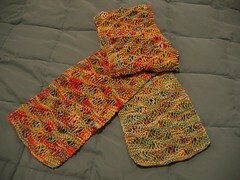 This is the picture and pattern (posted together for convenience) of my previously blogged-about scarf. Pattern is worked over a multiple of 10 sts + 10. Yarn: 260m (284 yards) of 100% Merino from Painted Yarns, sadly, no longer available. Repeat rows 1-8 until desired length is achieved, or you’re about to run out of yarn, ending with a row 6. Ragazza asked for the pattern for the Seafoam Scarf, so here it is. 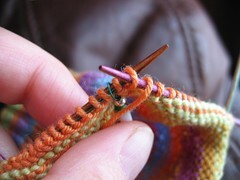 I CO 30 stitches on 4.5 mm pins for a width of around 6.5″. Repeat rows 1-8 until desired length is achieved, ending with a row 6. ETA: Full pattern can be found here. I’ve also cast on and ripped out new socks 3 times! I was going for a chevron-type pattern in that lovely Opal yarn below, but none of the attempts looked quite right somehow. Back to the drawing board….